Rough sleeping on the rise and the Government are looking the other way! More than 4,600 people slept rough on the streets of England last year. According to official figures released today after the UK had its coldest night of the winter. Local authorities estimated around 4,677 people slept rough on a single night last autumn, according to data from the Ministry of Housing, Communities and Local Government (MHCLG). This was up 2,909 since comparable records begun in 2010, but marked the first decrease of the decade, with a 2 per cent drop since 2017. Across England, the number of rough sleepers rose by 13 per cent in London, 60 per cent in Birmingham and 31 per cent in Manchester. 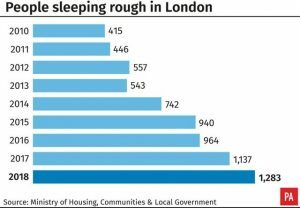 The place with the largest number of rough sleepers was London’s Westminster, with 306 people on the streets the night the survey was taken, up by 41 per cent since 2010. London accounted for 27 per cent of the total number of people sleeping rough in England, up from 24 per cent in 2017. The data came as the capital’s temperatures dropped to minus 6.4°C overnight. Shelter chief executive Polly Neate said that “fundamental action” was needed to tackle the root causes of homelessness and urged the government to invest in building three million more social homes over the next 20 years. 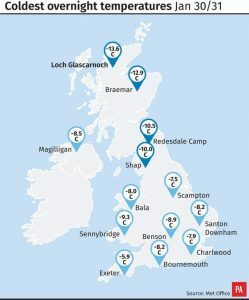 The data came as the capital experienced temperatures as low as minus 6.4C (20.5F) overnight, and the Met Office warned that temperatures could remain below freezing across the country during the small hours into next week. Charities seized on the rise since the turn of the decade, with Centrepoint head of public affairs Paul Noblet warning there are “many more hidden homeless people” in unsafe accommodation. ⚠️It is absolutely #freezing. If you see someone staying outside in this weather please call @Tell_StreetLink on 0300 500 0914 so they can connect them with local services. “Today’s snapshot statistics may show a slight decrease in the number of people rough-sleeping, but these figures are only the tip of a much larger iceberg as they only attempt to count the number of people sleeping rough on one night of the year,” he said. Crisis chief executive Jon Sparkes said the scale of rough sleeping is a “damning reflection on our society” as he urged the Government to tackle the root causes. Polly Neate, chief executive of Shelter, said: “The combination of spiralling rents, a faulty benefits system and lack of social housing means the number of people forced to sleep rough has risen dramatically since 2010. Did you wake up to snow today? This cold weather can be dangerous for people who are homeless and sleeping rough. Local authorities warned that preventing rough sleeping is “becoming increasingly difficult”, citing a homelessness services funding gap of more than £100 million in 2019/20. “Proper resourcing of local government funding is essential if we are going to end homelessness,” said the Local Government Association’s housing spokesman, Martin Tett. Communities Secretary James Brokenshire celebrated the drop as a success for the Government strategy backed by nearly £100 million of investment. But shadow housing secretary John Healey said the “desperately disappointing” figures underestimate the reality, urging ministers to do “much more to make good the huge damage done over the last eight years”. “This new count shows that rough sleeping has more than doubled since 2010, but even these figures mask the true scale of the problem, as the Government’s numbers are well known to be flawed and a massive undercount of the true level of rough sleeping,” the Labour MP added. The MHCLG acknowledges that the data is “subject to some uncertainty” and warned that some rough sleepers “may be missed” because of practical difficulties. These include people bedding down at varying times across large areas and the availability of spaces in night shelters and the weather. The difficulty in measuring the scale of the problem was shown in a separate study published on Thursday by the Combined Homelessness and Information Network. Outreach workers recorded 3,289 people staying on London’s streets between October and December, a 25% increase on the same period last year. The Government had the London figure at 1,283 in its study between the months of October and November. It’s just not good enough the Government need to act. The Unite union has taken the unprecedented step of opening its HQ offices in Holborn, central London, to give shelter to the homeless for at least three nights during the winter snap. 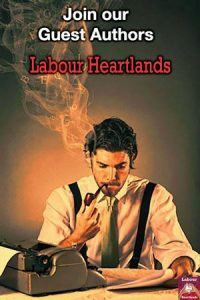 Unite general secretary Len McCluskey said: “The UK is the sixth biggest economy on the planet; it ought to be capable of putting a roof over the head of every citizen, but the fact that it does not is the direct consequence of failed Conservative austerity policies.